Thank you for a great Baykeeper Dinner! 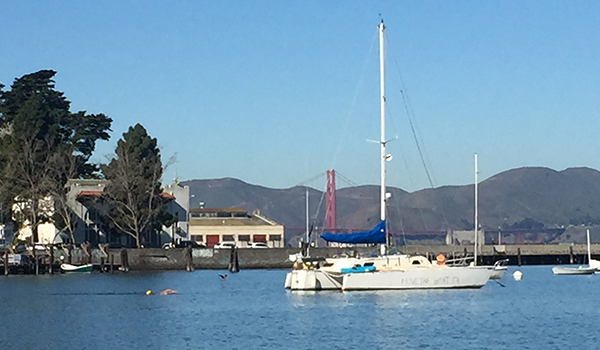 For months, a rundown sailboat has been illegally anchored in the Bay's most sheltered swimming cove, Aquatic Park. The boat's occupant does not have a required permit, and Baykeeper's pollution hotline has received a number of complaints of raw sewage dumped into the water. The Bay needs to be protected from this kind of illegal pollution. Specifically, law enforcement should have a way to get rid of boats that flout the law and discharge human waste that endangers people and wildlife. This one incident highlights a much bigger problem. Throughout the Bay and Delta, hundreds of boats are deteriorating or abandoned, discharging harmful sewage, trash, fuel, and other pollution. The situation is further complicated when people live aboard boats without being able to pay for boat maintenance and proper waste disposal. The cost of getting these boats removed is a major barrier for law enforcement. And local and federal agencies don't have the authority to act quickly. Baykeeper is serving on the Coast Guard's working group to address these issues, along with state and local agencies and recreational boating groups. We are taking lessons from other states and exploring legislative and funding solutions. Our goal is for state and local agencies to have the tools needed to remove boats like this—before their pollution hurts swimmers or harms beautiful San Francisco Bay. Read more about the derelict boat in Aquatic Park. Baykeeper recently told regulators that a proposed location for shoreline habitat isn't protective enough for species being displaced by development. Regulators and a project developer have proposed a mitigation bank site in Newark Slough, to offset shoreline habitat loss in other areas. But the site experiences regular flooding (as pictured, above) that pushes out wildlife, sometimes right onto a nearby, heavily-trafficked road. Mitigation banks are protected habitat areas intended to help heal the damage caused by environmentally harmful development. Unfortunately, the proposed Newark Slough site, far from being a rich marshland for endangered species like the salt marsh harvest mouse and Ridgway's rail shorebird, is often underwater and flanked by a busy street. Baykeeper and our allies urged the Army Corps of Engineers not to allow the slough site to be used as a mitigation bank. Instead, mitigation bank resources should be used to create high-quality habitat that preserves the Bay's wildlife and marshland. Read more about our advocacy work around Newark Slough mitigation bank site. 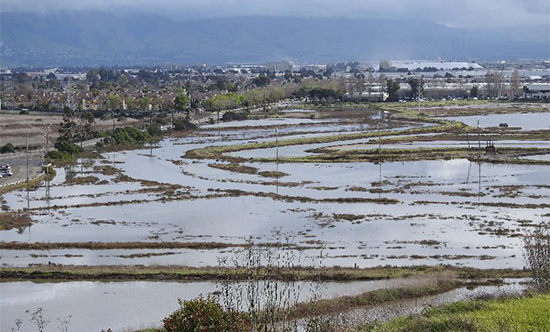 Tidal marshes around San Francisco Bay are a precious natural resource: they filter pollutants, capture excess carbon from the atmosphere, and provide flood protection for shorelines. The Bay's marshlands are also a prime resting and breeding spot for millions of birds. One of the most beautiful birds gracing the Bay's marshlands is the Great Egret (Ardea alba). Like many other heron species, the Great Egret nests in marshlands and ponds from February to June. They can be seen near and in marshes all over the Bay Area, foraging for frogs, crabs, insects, and sometimes even other birds. Many heron species, including the Great Egret, were nearly driven to extinction in the 19th century as the birds were aggressively hunted for plumage to be used as decorations on women's hats. But after protections were instituted in the early 20th century, populations rebounded. One of the earliest protections credited with saving birds from extinction was the Migratory Bird Treaty Act of 1918. This law is now under attack by the Trump administration. The proposed changes would make it difficult to hold industries accountable for causing bird deaths and would end incentives for companies to adopt proactive measures to protect birds. Baykeeper is partnering with other environmental groups around the country to defend long-standing environmental laws that keep wildlife safe. Your support for Baykeeper helps ensure birds and all other animals stay protected. 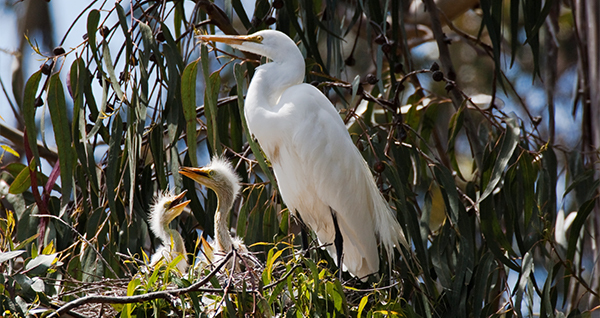 You can celebrate marsh madness with local Great Egrets by visiting the Palo Alto Baylands Nature Preserve, the Don Edwards National Wildlife Refuge, or other Bay marshland areas. Just make sure to take extra care during the spring and early summer not to disturb nests or hatchlings. Baykeeper recently won our 41st legal victory in our Bay-Safe Industry campaign to stop polluted industrial runoff from flowing into San Francisco Bay! Through our investigations, Baykeeper found that the Newby Island landfill facility in Milpitas had been releasing selenium, iron, nitrogen, and other contaminants into Coyote Creek and Lower Penitencia Creek for years. Both creeks are tributaries of San Francisco Bay, and these pollutants are known to harm the wildlife in these creeks and the Bay. Baykeeper reached a settlement agreement with the operators of Newby Island that requires improved pollution controls, including better cleanup of polluted materials on-site and regular tests to monitor pollution levels in the site's runoff. Read more about Baykeeper's 41st Bay-Safe Industry agreement. The 2018 annual Baykeeper Dinner was our best yet! 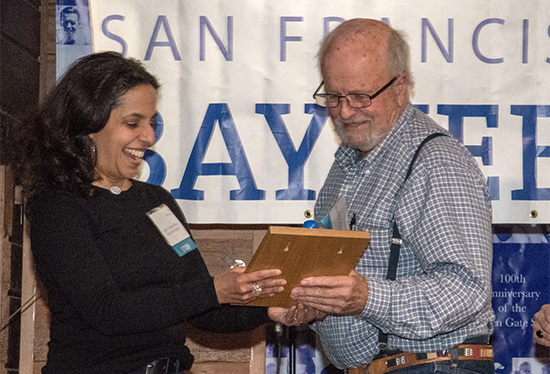 On March 4, Baykeeper partners and supporters celebrated an exciting year of keeping San Francisco Bay healthy and safe. Thank you to everyone who attended and supported the event. The Rose Foundation for Communities & the Environment, for its support of grassroots action to protect the environment and public health. Read more about our Blue Rivet Awardees here. We couldn't have put on such a successful Baykeeper Dinner without our dedicated event volunteers, our generous host the Dolphin Club, auction partners, and food and drink sponsors. Thank you all for an inspiring evening for the Bay! Click here to view the Facebook photo album of the Baykeeper Dinner. The 2018 Baykeeper Bay Parade will take place on Sunday, July 15! Save the date and plan to join us for our 5th annual on-the-water extravaganza. 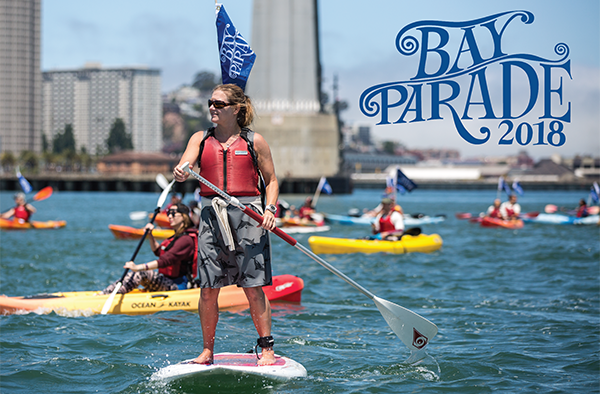 Swimmers, kayakers, SUPers, and boaters are all invited for a fun and active day to support and celebrate a healthy San Francisco Bay. The Bay Parade's grand finale will be broadcast live from McCovey Cove on the San Francisco Giants Jumbotron. Festivities will continue on-shore at the Bay Parade after party. Looking for a unique sponsorship or employee engagement opportunity for your company? Contact eliet@baykeeper.org for more information. Microplastics are emerging as a significant and widespread type of water pollutant. In March, Baykeeper continued our microplastics sampling of the Bay to determine how severe the problem is here. With our partners at the San Francisco Estuary Institute and 5Gyres, we took microplastic samples in the lower South Bay, south of the Dumbarton Bridge. While taking samples, our field team also spotted a group of comb jellies, so-called because of the comb-like groups of cilia that they use to swim in the Bay. Baykeeper is working to stop pollution so that these jellies, and all other Bay wildlife, are not harmed by pollutants like microplastics. 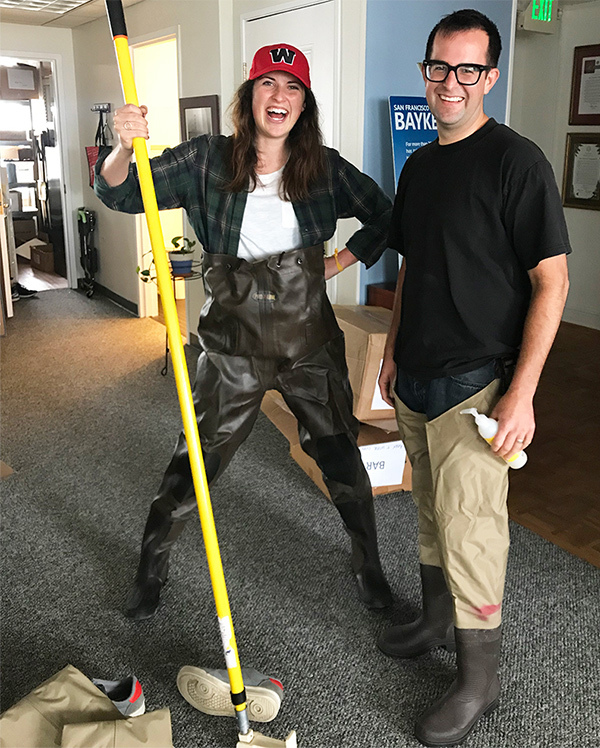 During rains in early March, Baykeeper's Field Coordinator Sienna Courter and Staff Scientist Ian Wren (at right, suited up in sampling gear) headed out to take storm water runoff samples all around Bay Area shorelines. The investigations and sampling data are used to monitor and identify the sources of excessive levels of heavy metals, oil, trash, bacteria and other pollutants flowing into the Bay, so that Baykeeper's science and legal team can work to stop this pollution. When we're out on pollution patrol and investigating shoreline sites, we often stop to pick up trash that we find floating in San Francisco Bay. And sometimes the trash is just strange. Recently, Baykeeper Field Investigator Sienna Courter was on the Baykeeper boat near the Sausalito shoreline when she discovered a large raft of tennis balls bobbing in the water. "I've never seen so many tennis balls at once in the water," she noted. "The dogs of Sausalito must be really bad at playing fetch."